Cover: "Emblems of Valor," painting by Don Troiani. Photograph courtesy Historical Art Prints, Ltd., Southbury, Connecticut. Published by Eastern National, copyright 2006. All rights reserved. Eastern National provides quality educational products and services to the visitors to America's national parks and other public trusts. To order additional titles in this series or other national park-related items, please call 1-800-821-2903, or visit our online store at http://www.eParks.com. 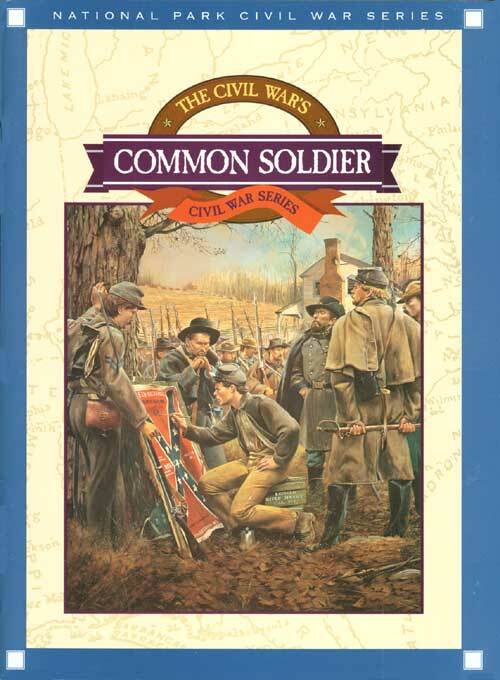 The following books are suggested reading for additional insights into the lives of Civil War soldiers: Bell Irvin Wiley, The Life of Johnny Reb: The Common Soldier of the Confederacy (Baton Rouge: LSU Press, 2007), Bell Irvin Wiley, The Life of Billy Yank: The Common Soldier of the Union (Baton Rouge: LSU Press, 2008) and John D. Billinggs, Hardtack & Coffee or The Unwritten Story of Army Life (Lincoln: Bison Book, 1993), Reid Mitchell, Civil War Soldiers (New York: Penguin Books, 1988), James M. McPherson, For Cause and Comrades: Why Men Fought in the Civil War (New York, Oxford University Press, 1997), Chandra M. Manning, What This Cruel War Was Over: Soldiers, Slavery, and the Civil War (New York, Alfred A. Knopf, 2007), Kenneth W. Noe, Reluctant Rebels: The Confederates Who Joined the Army after 1861 (Chapell Hill: The University of North Carolina Press, 2010), as well as the Teaching with Historic Places Lesson Plans: Choices and Commitments: The Soldiers at Gettysburg, First Battle of Manassas: An End to Innocence, and The Battle of Stones River: The Soldiers' Story.